These lightfast, water-soluble ink stick pencils can be mixed with water to create colorful, fluid, ink-like effects. Once dry they will resemble Sumi ink brilliance, will not dissolve, and other media can be applied over the color to achieve the desired effect. This line also offers an insoluble outliner pencil to define border limits to drawings and to keep colors from bleeding together. 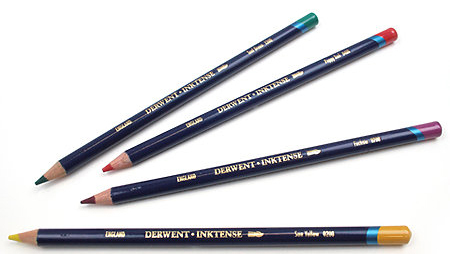 Inktense pencils can also be used on fabric to create interesting silk paintings and unique quilting projects.